The weather in Maryland has been slightly on the warmer side, 50's in December is very unlikely but I am not complaining! It feels weird (sort of) to flash skin in winter but when the weather permits, I happily obliged. VERY CUTE!!! love the edgy details, the denim jacket and camp work ironically well with this girly look! I love the sequins with the denim jacket, but I am afraid of you breaking the heel on those shoes and thus breaking your leg! Be careful! Absolutely love this look! I scored a black sequin skirt during cyber Monday and you've inspired me to try to style it casually. Love the "dayquins" you've pulled it off so well!! Those shoes are incredible too! Great look! I love your shoes girl!!!!! great outfit!! I am all about sequins for daytime and those shoes are so fabulous!! Those shoes: HOT! LOVE daytime sequins too! It definitely works here with all your other causal pieces! This might just be the absolute perfect look! I'm lovin' the denim jacket with the sequins to dress it down a bit! this is just perfect love everything that skirt is to die for!!! those booties.. I die. I LOVE THEM! warm days we've been having! I love this look! The camouflage clutch just pulls everything together. Chic! i love your skirt..you pulled it off really good to make it a casual look and i adore your boots..great style! THOSE SHOES!!!!!!!!!!!!!!!!!!!!!!!!!!!!!!!! <---- they deserve that many x 100 exclamation points. Great outfit! 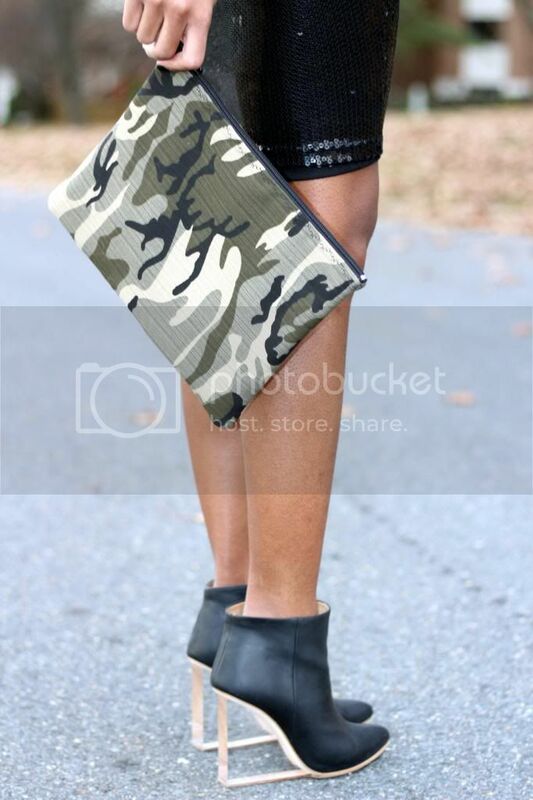 I love the camo clutch!! WAAAAAW!!! not like, lotve it!!! Love your skirt and shoes. Fabulous!!! So pretty! I love the touch of camo to harden up the otherwise girly look.